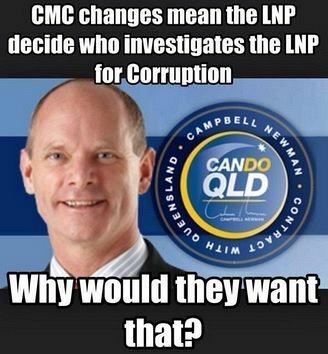 The Newman Government has ignored Fitzgerald, other senior legal figures and nearly 10,000 petitioners by scrapping Queensland's Crime and Misconduct Commission​. Steve Bishop reports. The Newman Government has killed the independent Crime and Misconduct Commission with legislation passed by Parliament at 11.17pm on May 7. In its place will be a Crime and Corruption Commission, with much reduced powers and Government-appointed commissioners. The Government ignored the warnings of senior corruption fighters and lawyers that its legislation would kill the public’s independent watchdog and create a political lapdog, which would bury government corruption while snarling loudly at opponents. “... appear designed to ensure that the restructured commission will not investigate corruption by Queensland politicians and public officials if that might embarrass the government." The new body will be in place when, if the Government has its way, multi-million dollar contracts are being handed to companies buying or leasing public assets. According to what it has called 'Strong Choices', the Queensland Government wants to dispose of assets worth $25 to $30 billion. Mr Drummond, along with former corruption inquiry commissioner Tony Fitzgerald, former Crime and Misconduct Commissioners, lawyers’ associations and legal experts were united in their opposition to the legislation. A Government-dominated parliamentary committee unanimously opposed a plan to limit corruption complaints to those people willing to make statutory declarations. Nevertheless, the Government has focussed on preventing anonymous complaints by forcing most complaints to be backed by statutory declarations. Critics of the proposal point out that if this became a requirement of Crime Stoppers, useful information would immediately dry up. But the Government is restricting the new commission’s ability to decide on what issues it should research. The Minister has already made it plain that he is not likely to approve research into political donations. The legislation removes the Commission's responsibilities for preventing corruption in the public service. "The Bill...takes the final step needed to remove the Commission's independence entirely and bring it completely under Government control." The legislation has its roots in an Inquiry into the CMC by Professor Nicholas Aroney and former judge Ian Callinan QC. The Inquiry recommended many changes and advocated the creation of an implementation panel consisting of the Public Service Commissioner, the chairperson of the CMC and two others − including a senior lawyer − to formulate their recommendations into a Bill. They specifically stipulated that the fourth member of the panel should not be a current or former public servant. Not only did the government ignore this latter recommendation, but it put the public servant it chose, John Sosso − the Director-General of the Department of Justice − in charge of the process. "When the [corruption] inquiry was established in 1987 the National Party Attorney-General was advised and influenced by a small ambitious group of Justice Department bureaucrats. The Attorney-General appointed one, John Sosso, as secretary to the inquiry. Sosso didn't last long in that role but returned to the Justice Department which, as the inquiry's report notes, did little willingly to assist the inquiry." What was it the Fitzgerald Report noted in 1989? "The Justice Department and the Police Department did not intend to lose control .... Reasons were advanced for restricting the Commission's access to material." “Sooner or later the Premier will have to bring the Justice Department under control or risk public humiliation." For more than 20 years, the major parties had agreed that a proposed commissioner of the watchdog had to receive bipartisan support from a parliamentary committee. The Government has scrapped this practice and will appoint someone to its new commission who it alone finds acceptable. The proposal to scrap the need for bipartisan approval came solely from the implementation panel. "What evidence are you aware of that the current bipartisan requirement is not working?" Mr Sosso refused to say if his department had any evidence. The legislation was rushed through after being unveiled in Parliament on March 19. It had to be referred to a Legal Affairs and Public Safety Committee* for submissions from the public. The committee, which had been sacked by the Government only months before and reformed with only two non-Government members, has spent up to four months examining other Bills, but in this case submissions had to be made in only three weeks. One day was given for a public hearing. The committee delivered its recommendations to the Government on April 30 and on May 7 Parliament passed the Bill. The widespread criticism of the legislation suggest it is highly unlikely that anyone with the qualifications, experience and integrity necessary for the position of Commissioner will trash his or her reputation by applying for such a position. Anyone accepting such a position is likely to be viewed by the legal profession and by public servants as a puppet of the Newman Government — just like the current acting chair. * In an earlier version of this article we said the PCMC has been receiving submissions from the public about the legislation. This was an error in the editing process and not by the author.